Increasing share of different fields in publications by North American PhDs. First, we find a clear trend toward heavier co-authorship – that is, larger author teams. Hamermesh (2013) finds a clear trend of increased co-authorship in top economics journals between 1960 and 2010, and we confirm that this trend is not restricted to top journals, and applies to all peer-reviewed journal publications by North American PhDs over the last decades. Single-author papers were clearly dominating the scene in terms of quantity2 up until the mid-1980s. Two-author papers then took over and dominated from the late-1990s and early 2000s on. There has also been a strong increase in the proportion of three-author papers, and, over the past decade, papers by four authors or more. 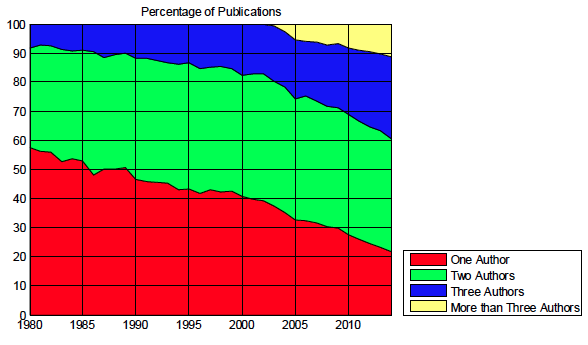 The share of single-author papers diminished from about 60% in 1980 to about 20% in 2014. Two-author papers accounted for 30% of all publications in 1980, increasing to about 50% during 1990s, and then remaining between 40% and 50% since then. Three-author papers made up less than 10% of all publications in 1980, increasing to 20% by 2005, and up to 30% by 2014. Publications with more than three authors start showing up in data from 2000, accounting for less than roughly 5% of all publications in 2005. This proportion increases to slightly above 10% by 2014. Note: All publications prior to 2000 with more than three authors are listed in the EconLit as single author papers with an “et al.” following the first author’s name. Complete lists of authors for more-than-three-author papers appear in the dataset starting in 2000. According to Conley et al. (2013) less than 1% of publications from 1985 to 2000 have more than three authors. 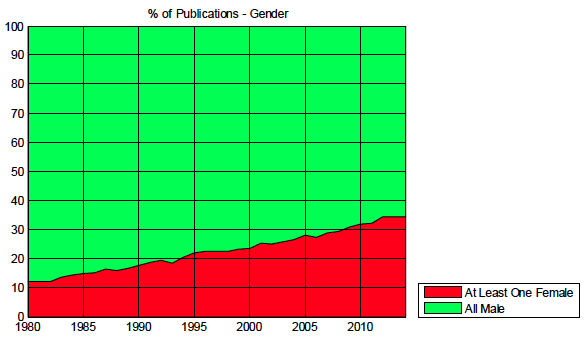 Figure 2 shows the share of total publications by North American PhDs that have at least one female co/author. As can be seen, female representation has been steadily increasing since the 1980s, potentially reflecting increased research productivities of North American female PhDs over the last few decades. As can be seen, roughly 10% in 1980, slightly more than 20% in 1995, and about 35% in 2014 of all North American PhDs’ publications have at least one female author. Conley et al. (2016) find that female PhDs account for 20% to 25% of each graduating PhD cohort in the 1980s and 1990s. Further, among cohort members that have at least one peer-reviewed publication within six years after graduation, female PhDs make up again about 20%. It thus appears that female PhDs were underrepresented in author teams in the 1980s, but this pattern changed in late 1990s and 2000s. In this section, we investigate the representation of different research fields in the peer-reviewed publishing activity of North American economics PhDs. We follow Card and DellaVigna (2013) in how we match JEL codes to major fields within economics, except that we do not distinguish between the theory and microeconomics fields. A single publication can belong to various fields if these are indicated in its JEL codes, hence a single publication may count for both, for example, macroeconomics and labour. Macroeconomics has consistently had a 15% to 20% share of total publishing output since 1980. Similarly, econometrics and industrial organisation have also maintained more or less constant shares over the period. International economics had a share of 10% for much of the period, but this share drops and remains below 10% from the late 2000s on. We observe a sudden change in the shares of microeconomics, finance, development, and economic history at or shortly after 1990. These shifts must be interpreted with a grain of salt, however, because the JEL classification system underwent a significant change in 1990. 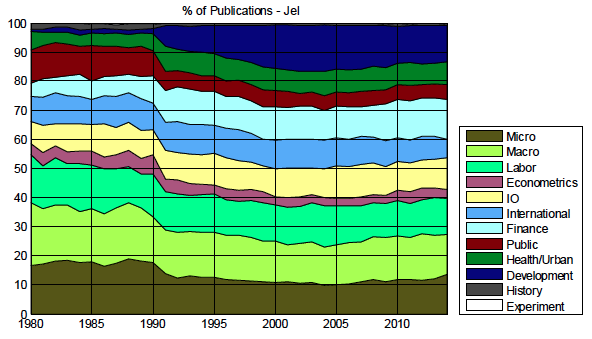 The updated JEL classification provided a larger selection of topics, and hence a finer differentiation between various fields. This may be responsible for the sharp changes in various fields’ share in 1990. The share of finance grew from slightly more than 10% in 2000 to almost 15% in 2014. Development economics grew from about 10% in 1995 to more than 15% in 2005, before levelling off at 10% by 2014. Although the various fields’ shares don’t remain completely constant over years, we observe rather little variation for most fields over the course of three and a half decades. Nevertheless, international economics, development economics, and finance present exceptions to this overarching trend. It is hard to foresee how the research and publication patterns of North American economics PhDs —and probably also those of economists from all over the world— will change over the next years. But a broad overview of how things changed over the last three and a half decades hopefully provides the general economics audience with a better understanding of what might come. Card, D and S DellaVigna (2013) “Nine facts about top journals in economics”, VoxEU.org, 21 January. Conley, J P, M J Crucini, R A Driskill and A S Önder (2013) “Incentives and effects of publication lags on life cycle research productivity in economics”, Economic Inquiry, 51(2): 1251-1276. Conley, J P, A S Önder and B Torgler (2016) “Are all economics graduate cohorts created equal? Gender, job openings, and research productivity”, Scientometrics. Coupe, T (2003) “Revealed performances: Worldwide rankings of economists and economics departments, 1990-2000”, Journal of the European Economic Association. 1: 1309-1345. Hamermesh, D S (2013) “Six decades of top economics publishing: Who and how?”, Journal of Economic Literature, 51(1): 162-172. Önder, A S and H Yilmazkuday (2016) “Thirty-five years of peer-reviewed publishing by North American economics PhDs: Quantity, quality, and beyond”, mimeo. Top five journals are AER, QJE, JPE, Econometrica, REStud. Top six to twenty are J Financial Ec, JME, REStat, JET, J Finance, J Econometrics, Economic J, Rand J Ec, J Public Ec, J Int Ec, JEEA, European Ec Rev, J Labor Ec, Int Ec Rev, Games and Ec Behavior. In this column we focus on the quantity of publications, however we offer an extensive discussion about quality aspects in our recent working paper (Önder and Yilmazkuday 2016).